13 July – Cantilon Chamber Choir from Edmonton, Canada. Recitals are free to those already in the Castle. 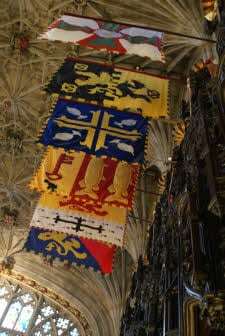 Scaffolding was erected in the North Quire Aisle in June allowing experts to undertake conservation cleaning of all the stonework in the area. 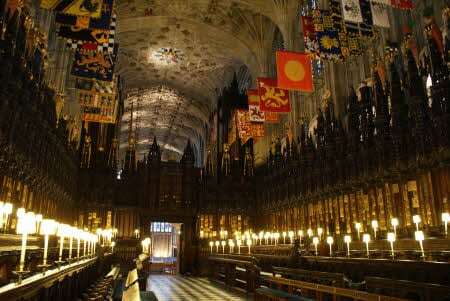 The North Quire Aisle remains accessible beneath the scaffolding; it is from here that visitors can see the side chapel where King George VI and Queen Elizabeth the Queen Mother are buried. Outside the Chapel, near the south door is the most recent grotesque to be installed. It was put in place in mid June. 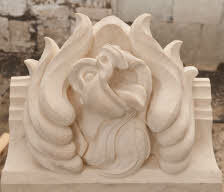 The carving, undertaken by a student at the City & Guilds in London, depicts a phoenix. The sculpture programme is a fascinating, innovative and exciting part of the overall refurbishment programme. For more information or to support the cleaning and conservation of old sculpture and the provision of new sculpture please contact sculpturefund@stgeorges-windsor.org. During part of July and August the Nave is cleared of chairs to give visitors more space and also to mirror the lack of seats that would have been the everyday state when the Chapel was built in the 15th century. A stone bench round the edge of the Nave allows visitors, both then and now, to rest. Although the Chapel choir is on holiday from 18 July daily services continue throughout the summer months without a break. There is also a 12 noon service of Holy Communion on Fridays. One of the ways that St George’s Chapel is marking the 400th anniversary of the King James Bible, also known as the Authorised Bible, is an exhibition of Bibles and other treasures from St George’s Chapel Archives and Chapter Library, accompanied by explanatory boards by the University of Sheffield’s Department of Biblical Studies. 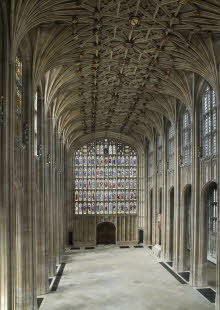 The exhibition in the South Quire Aisle from 1 April to 2 October 2011 is open during Chapel visitor hours (Monday-Saturday 10am-4pm); Windsor Castle admission rates apply or free entry with Advantage card. Please check the diary for any closures. Melvyn Bragg will give a talk about the anniversary on Sunday 2 October at a Windsor Festival event in St George’s Chapel. 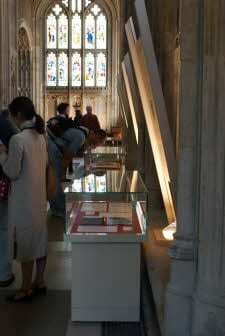 An exhibition in the Dean’s Cloister marking the 90th birthday of HRH The Duke of Edinburgh. Photographs and other items have been brought together for display until 29 July (Monday to Saturday during Chapel visitor hours; Windsor Castle admission charge or free entry with Advantage card apply). 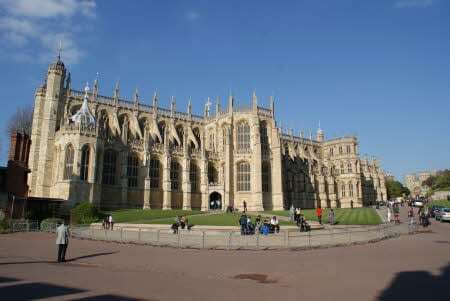 The exhibition can be seen at the exit from St George’s Chapel and has been curated to be complementary to the Royal Collection exhibition running for the rest of the year in the Drawings Gallery, Windsor Castle. The exhibition in the Cloister has been generously supported by ‘The Times’. 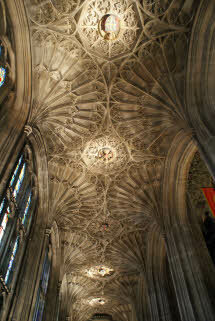 The Chapel is open to visitors Monday to Saturday from 10am to 4pm. However on Saturday 6 August the Chapel and exhibitions in the Dean’s Cloister and South Quire Aisle will close at 1pm. 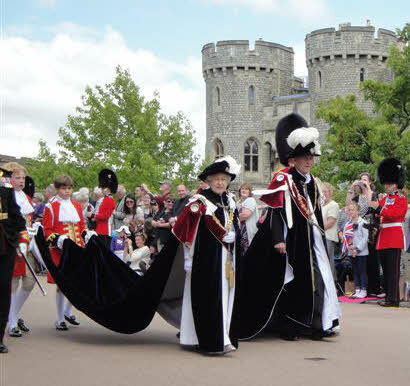 Windsor Castle admission charges apply; the ticket price includes access to the precincts of Windsor Castle, the State Apartments, Queen Mary’s Doll’s House and the Drawings Gallery in addition to St George’s Chapel. 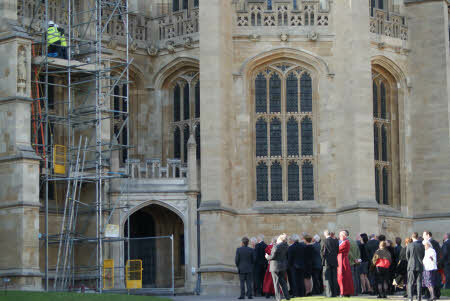 Tickets can be booked in advance via the Royal Collection website click here. Whenever the Chapel is open to visitors the Chapel Giftshop, located in the Dean’s Cloister at the Chapel exit, is also open. Many exclusive products are on sale only in this shop including new Castle design china click here.